Literally one-sided territory. A territory which if successfully invaded will leave you with nothing. The defective strategy based on such a territory. Many strategies (including omoyo) welcome or even invite invasions, in the hope of gaining compensation elsewhere. In the case of ippoji, in contrast, the owner of the territory gains no compensation when it is invaded--he just loses the territory. The proverb avoid ippoji can thus be interpreted as advising us not to build territories without some way to gain compensation when invaded. Ippoji is also sometimes used to refer to the specific case of a single, huge monolithic territory, which if successfully invaded will leave you with nothing at all. "Ippoji in Japanese means a single large territory; it is usually a losing maneuver. Black's moves from 1 to 7 show an admirable single-mindedness of purpose, but White 8 is a perfect cool answer. The lower edge still can't be called territory since it takes too many moves to secure it absolutely." Instead, he suggests . . . first think for yourself . . . this. NickGeorge: Is this at all a reasonable move? Bob Myers: Yes, Rin's point is exactly that this kind of invasion will work all too well (and that therefore Black should find an alternative strategy). The point is that Black's territory is easy to invade and that if it is invaded he will be hard-pressed to gain compensation elsewhere. Many Westerners would not use the term ippoji to refer to this position because they believe it only applies to a single massive territory. In this position, of course, Black's territory is not particularly large, and he does have other territory, namely in the upper right. The inadvisability of ippoji stems, not from the fact that it necessarily involves a single territory, but that it can be invaded without corresponding compensation. 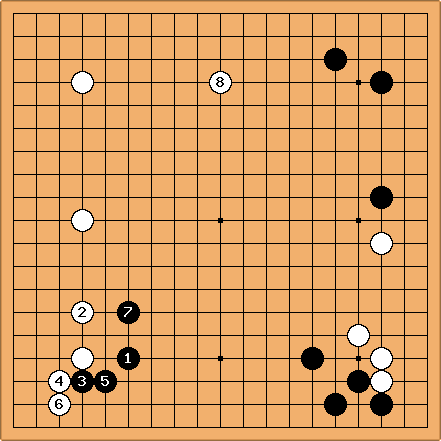 In this position, White's strength to the left and right means that Black is unlikely to gain any compensation elsewhere from the invasion.